Aarnav is only 17, but his work in the last three years has been instrumental in saving hundreds of farmers from losing hope in the Vidarbha belt after they suffered crop failures. What is the first word that comes to your mind when I say Vidarbha? Farmer suicides, natural word association, if you live in India, right? Did you know that from 1998 to 2018, India recorded a whopping 3 lakh farmer suicides? To many of us who live in the city, this may just be a number. We read about farmer suicides, discuss it over tea and then forget about it. But this wasn’t the case, with New Delhi teenager, Aarnav Aggarwal. When he originally started interacting with farmers, he realised they weren’t open. “They treated me like a child, saying, ‘What could this boy do that we couldn’t, to save us from mounting debts?’ I didn’t even know how to interact in Marathi. All I knew was that I had to build their trust,” he says. Award-winning farmer B R Kathalkar came to his rescue. The co-founder of UjjBhav, Aarnav’s mentor and guide, he hosted the young teen in his own home. Alongside his farmer group, Krishi Vikas Audyogic Saha Sanstha, formed in 2001 with 48 senior farmers and agriculture professionals, he helped extend the initiative to its rightful beneficiaries–small and marginal farmers. With over 452 farmers and agricultural experts in its network, UjjBhav has created a mentorship programme where deprived farmers are connected with successful farmers and professionals in agriculture, who handhold them through day-to-day field-related issues. Whether it is creating awareness about government schemes or enrolling them to them to avail the benefits or guide them through the process of crop selection to crop realisation, small and marginal farmers receive support throughout. All of which is done, as a voluntary support, completely free of cost. When they first started interacting with the farmers, Aarnav realised that their problems were too many with no single solution. From degrading quality of soil, low yields, loss of crop due to pests, interference by middle-men and increasing debts, the farmers were stuck in a never-ending circle, where death looked like a better option than tackling their issues. Known as the cotton-belt, most of these farmers were suffering losses after the pink bollworm pest attacks and solely because the process of growing cotton was so slow that they weren’t getting returns even on their initial investment. Another issue was their increasing dependence on the use of chemical pesticides. A direct effect of the programme over the last three years has been that farmers are giving up the use of pesticides and moving towards organic farming. In addition, after realising that cotton was bringing them losses, they have adopted intercropping techniques, where they plant two or more varieties on the same piece of land. This has not only helped them recover their initial investment but also earn profits. “Most of these farmers have seen a 25% hike in their income,” says Aarnav. Today, Vishnu Tale’s 1.5-acre organic farm yields more than a 10-acre farm that is incessantly sprayed with pesticides. With his earnings, he has furnished his home with a cooler, TV, latest gadgets and has recently bought a new bike too. How does UjjBhav’s team keep track of the progress? UjjBhav has a dedicated team of volunteers that make weekly and seasonal reports about the progress on the ground. Aarnav is in touch with all the members, including mentors and the core team in Vidarbha on a daily basis and discusses weekly and monthly reports over Skype. The beauty of this entire initiative is that most of the costs, including travel, are borne by the volunteers, Aarnav and the mentor farmers. While a few corporates come forward to help now and then, UjjBhav, overall, is a self-sustained initiative. Apart from the mentorship programme, the team is also working towards reviving barren community land in the region. “Most of the community land lies unused and barren due to disputes over ownership. 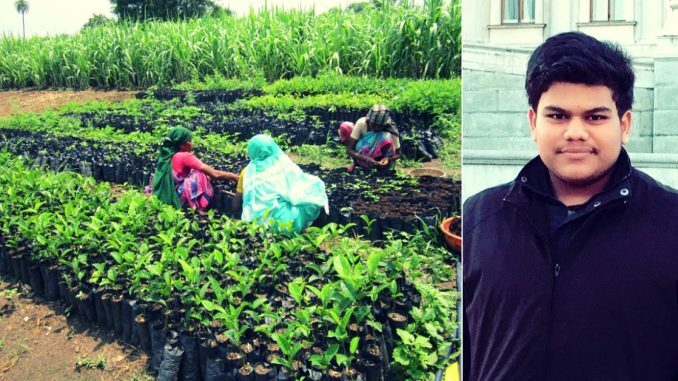 So we decided to turn this dispute into a symbol of solidarity among farmers by helping them revive it with a continuous plantation drive,” says Aarnav. Every weekend, the farmers unite. They invest or raise money and plant the saplings themselves. Till date, they have managed to plant over 6,150 trees. And tey hope to plant 10,000 by the end of the year. When asked what is it that the farmers need, Aarnav says, “They don’t need your money, just your time and guidance. The impact of our initiatives reflects not just in the increased incomes of the farmers but also in the sense of community we have built in them. Our mentors and volunteers are invited to be a part of their smallest celebrations. That, to us, is a bigger achievement,” adds Aarnav. The idea is to now extend the initiative slowly, he says, from the seven villages they currently work in, to the rest of the country. “While the purpose is to make farmers aware of the resources available at their disposal and teach them to be self-reliant, as farmers, we must have each other’s backs at all times than rely on third party support. Even in the deepest of debts, we shouldn’t have to wait to be rescued but be our own heroes,” Kathalkar signs off.